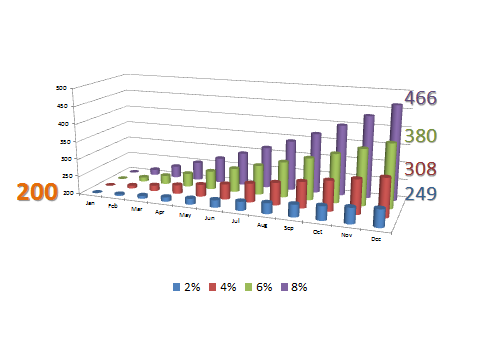 Better Projects: What does 2 percent scope growth per month look like? 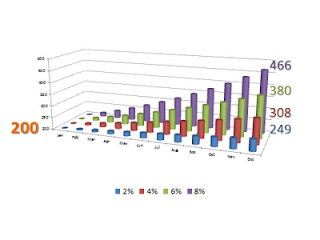 What does 2 percent scope growth per month look like? If there are industry numbers that say scope typically increases 2% per month... Well, two percent doesn't sound much does it? As Albert Einstein said; the Most powerful force in the universe is compound interest. And who's to say you are industry average. In the projects I have measured in this way rates of change have been as high as 8%, and at times even higher. What a difference a few percentage points can make! Two percent is just industry standards. I really recommend you check out what is happening on the projects you work on. Are there patterns? Is there useful information in here that you can use? The very first thing you can do with this data once you have it is start planning your contingency buffers. If you are going to run a 12 month project you now know what the likely size of the target really is. You can also use this information to negotiate for leaner backlogs, or smaller releases. Right from the start you could use this information to negotiate for leaner backlogs, or smaller releases. The clock starts on this scope creep stuff pretty much from when the requirements discovery work starts and doesn’t stop until you are in production, so if you have a 6+ discovery period you can see the sort of troubles you are likely to face.